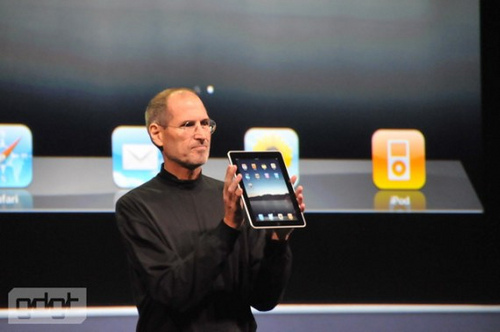 [Rumor] Apple To Charge For iPad iOS4 Update? Apple will NOT be charging for the update, more here. If the team over at Stuff.tv are to be believed, Apple is set to charge iPad owners for the iOS4 firmware upgrade, reintroducing a paid upgrade structure that was once present for the iPod Touch. Notice the emphasis on the world “once” – Apple recently rescinded the paid upgrade structure for the iPod Touch, so naturally we are skeptical about this report. The rumor surfaced by way of developers working on an upcoming iPad application who then in turn contacted Stuff.tv to share the good news. Asked how sure they were about the forthcoming iOS 4 charge, our source replied, “Definite.” And we don’t think they’re wrong. As for how much, who knows. Previous iPod Touch updates were priced at £5, we imagine the iPad iOS4 update would hover around the same amount should the rumor materialise to be true. It could be a huge PR disaster for Apple, implementing charges for previously free updates so soon after its handling of the iPhone 4 and its signal issues. Stay tuned, we’ll update you as soon as anything concrete emerges. Read next: Steve can be so evil!